I'm writing in the library of my mom and dad's retirement center. I have a view of the fireplace that burns non-stop--the benefits of a gas-powered fireplace! The coffee machine isn't far away. There's no wi-fi in the guest rooms, but I'm writing in a much cozier spot. I'm having a great visit. It's an interesting change of perspective. It is sobering to realize how easy it is to tip into poor health--yesterday I went with Mom and Dad's singing group to the Memory Care Unit, where most of the residents have some form of dementia, which I assume is permanent. It was somewhat distressing, although everything was orderly. I was probably more distressed than the residents. They tapped their fingers and nodded their heads and perhaps wondered why we were singing "Sleigh Ride" along with patriotic songs. Or perhaps they're not trying to make sense of the world anymore. We've eaten several meals at the dining center. So far, my favorite has been a Buddha bowl with a beautiful piece of salmon. The rest of the bowl was brown rice, raw baby spinach, edamame, cherry tomatoes, and shredded carrots--really delicious, considering how simple it was. My mom and I went shopping, and I heard the words I never thought I would hear: "Those jeans are too big for you. Let me get you the next smaller size." Lest you get the wrong idea, I'm still not wearing jeans in the single digit size. I still need pants that come from the Women's section of the store. But yesterday, I found several pairs that fit, which has almost never happened to me when I shop. In fact, we almost didn't go shopping yesterday--I figured there would be no point, since all the clothes on sale would be winter clothes, which aren't of much use to me in South Florida. Instead, I found some "boyfriend jeans." The saleswoman explained that they're like your boyfriend's pants, much bigger through the hips. Really? Where have these boyfriends been? I have always been the bigger one, although it's been decades since I've had a boyfriend and not a spouse. I'm not proud--when I find pants that fit, I buy them, regardless of what they're called. Call them fat lady jeans, and I'm still on board. Given how seldom I find pants that fit, I don't pass up on them. Even better, they were on a super sale. Once they cost $89.99, which I would not pay for jeans, unless they vacuumed the house on their own. Yesterday I got them for $19.99. Hurrah. I've been enjoying having relaxed time with my mom and dad--what a treat. I've also had time to read. I'm reading my dad's copy of Jon Meacham's The Soul of America: The Battle for Our Better Angels. If you need to feel hopeful about the future in this troubling political time, this book is for you. Here's a quote from the book to inspire you this Thursday; I admire both the sentiment and the imagery: "If we expect the trumpets of a given era to sound unwavering notes, we will be disappointed, for the past tells us that politics in an uneven symphony” (p. 103). I am writing this post in the library of the retirement community where my parents live in Williamsburg. I can't get wi-fi in my room, and I'm racing against a battery that's draining. I decided not to transport the power cord, but in the future, I will. I had thought about visiting at the holidays, but in many ways, it's easier to come in January or February. We're all busy people, and my parents can be even busier than I am, even though they are retired. It was easier to find time when we're free after the holidays. The airline fares are cheaper too, although I don't know if we have fewer people travelling, since I'm flying from one of the few warm places in the nation in January. Yesterday before I left, I had a delightful morning with my friend who was giving me a ride to the airport. We talked about a manuscript we're creating, we ate goodies she had baked, and we had wonderful conversations catching up. I had a fairly easy flight yesterday--we had a brief delay for maintenance, but it ended up being just under an hour delay, so we were all happy--there had been rumors that the delay might be 3 hours. The flight was easy but a bit bumpy at the end. One of the things that made yesterday's airport experience feel fairly easy is that I had a great book: Stephen McCauley's My Ex-Life. It's been on my list since I heard him interviewed on NPR's Fresh Air. I got lost in the book, in a way that I don't often get lost these days. It's always a relief to me to get lost in a book. When it's been awhile, I worry that I'm losing my ability to read in a deep way. The weather was rainy, not icy, so we had a safe drive home. If the flight hadn't been delayed, we'd have had an easier drive because we'd have had more daylight, but oh well. We had a cozy evening by the fire. I feel fortunate that I have a good relationship with my parents, that it's easy to get to them (most trips), that they're in good health, as I am. I'm happy that I could find a few days when I was less needed at work. I'm grateful for a trip to see my parents for happy reasons--I know that it won't always be this way, and I'm treasuring these times while I have them. Today I head to Williamsburg, Virginia to spend a few days with my mom and dad. My spouse will stay in South Florida to teach his classes and hold down the home front. I had thought about trying to plan a trip at the holidays, but in some ways a January trip is easier and cheaper. We're all much less busy in this last week of January than we were in December. That decision was relatively easy, but now for the hard part--the packing. I am flying, so the amount of stuff I can bring is more limited than if I had a whole car to fill up. I am fortunate that my mom and I wear the same size coat, so I don't need to bring one. They'll meet me at the airport with a coat to wear. I don't really own a coat that's appropriate for the cold weather that the nation is experiencing this week. I'm also lucky that they have a washer and dryer. If all my socks get soaked, I have a way to fix that. I am wondering if I need boots. I think I'll take a risk and leave them behind. When I fly to Portland in March, I'll need to bring them then; that's one reason why I'm flying Southwest to the AWP, so that I can have suitcases with me. It's not just clothes and shoes, of course. I'm thinking of this time as a mini-retreat, so I'll bring markers and a sketch book, along with my manuscript of linked short stories. I'm looking forward to a chance to read it straight through. And I'll bring my laptop, although I probably could do without it. I am taking books, of course, books printed on paper. Here, too, I'm lucky. My folks have books if I run out. I also feel lucky in that we all like to read. I wouldn't mind of few days of reading together, cooking together, and good conversation. Again, I'm lucky--it's exactly the kind of get-away I'm likely to have. In this work year of an accreditation visit, let me grab these opportunities while I can see them. Poetry Monday: "Good Friday in the Telemetry Ward"
I just finished reading Barbara Ehrenreich's newest book, Natural Causes: An Epidemic of Wellness, the Certainty of Dying, and Killing Ourselves to Live Longer. I saw it at the library and remembered her article that came from the book. It's one of the more interesting parts of the book, but the rest of the book has merit too. She's often most interesting to me when she's looking at the sociology of a subject, but in this book, her discussion of cell biology covered material I didn't know. And some of it was newer information. Until recently, we didn't have much knowledge about the role of macrophages in spreading cancer throughout the body. We still don't have as much knowledge as we will, but it's a different way of thinking about cancer, that there are cells that help blast openings in blood vessels that allows the cancer to travel. 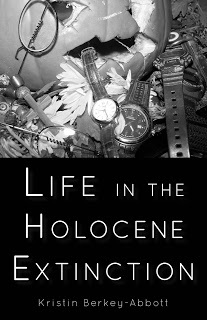 I kept waiting for her to dive a bit deeper into the societal fear of dying, but that was not the focus of this book. This book explored our desperate wish to stay mentally sharp and physically flexible into old age--also a worthy topic. As I flipped through the book this morning, I came across the list of books that she's written--what an amazing assortment. Most of us will remember her work documenting how the working class live and barely survive (Nickel and Dimed and Bait and Switch). But she's done a lot of work on the medical profession, especially historical and feminist work. Her current book doesn't explore the hospital as much as I thought it might. If you read the article back when it appeared in April of 2018, you've read about as much as she discusses. I think that our fear of aging and death is rooted in our fear of hospitals. I remember when my mother-in-law was in the hospital for months as she died, and I thought, well, my fear of hospitals is not very irrational at all. I was reading a lot of Beckett at the time, but I can't remember why. And so we wait in Beckett’s world. or what the news will be. dietary diversions but no nourishment. Day after day, we appear. Have we done our duty? Can we do no more? news or good? Who can tell? machines that must take over. No true night in the telemetry ward. my mother-in-law studies for hers. the limbo-like suspension between worlds. We spent part of yesterday at the church having a visioning session/retreat about the future. A developer wants to buy part of our lot. We have 4 acres, but if you drive past the church on the major road, you don't realize what a big lot it sits on. The developer has offered to build us whatever we want on the back part of the lot for ourselves as part of the sale. Of course, this has all been verbal. We're waiting on a more formal something in writing. We've had interest before, and often people don't follow through, because they have to do all the work. We were not visioning what we would want to build, although that was a tiny part--but we stayed away from that, because it might not happen. But we spent the afternoon talking about where we are as a church, and where we envision going. It was interesting to me, both for the information and the process. We began by introducing ourselves by more than our name: how long we've been at the church, what we like, and what we're worried about as we think about the future of this church. Most of us were worried about dwindling numbers of attendance. I was struck by how many people said, "We've got to get more young people attending." But what if we don't? Maybe our mission field is midlife and beyond. Maybe that's a growth model we should consider. After all, people with midlife might bring younger people with them. But then again, they might not. And that could be O.K. We are early in this visioning process. In an ideal world, we wouldn't build a thing before we worked our way through a long, intentional process. It will be interesting to see where it leads us. Yesterday was another strange day, to hear that Roger Stone lives in Ft. Lauderdale and appeared at the U.S. Courthouse downtown. As I left spin class yesterday morning, a sheriff's helicopter landed on the roof of the hospital, which I thought was strange--that's not usually how patients get transported. Now I wonder if it had anything to do with the national news. The courthouse is not that far away from the hospital that houses the wellness center where I go to spin class. And by afternoon, the good news that the government would reopen. Hurrah! Of course, in 3 weeks, we could find ourselves in the same place again, but I'm guessing that everyone will try to avoid that. Shut downs don't usually work well as a political tool, and now maybe everyone will remember that. In between, I had a pleasant day at the office, with enough down time between dramas to get my extensive filing done. January brings the updating of many forms, and since they need to go in the 7 tab faculty folders in a particular way, I usually take care of it. That also gives me the opportunity to check to make sure that everything is in place. Occasionally I say, "Hmm, the last time we observed this faculty member was late 2017. What year is it? Better get that on the calendar." We have mostly adjuncts, lots of them, and it's easy to lose track of all that needs to be done and then recorded on paper. I like the vaguely spiritual imagery--clearly I'm still back in Epiphany, with its star symbolism. I like the railroad, with its recall of the underground railroad and the idea of riding the rails that took off in the 1930's--and the ways that people get through Mexico in this current immigration story. I think I've got the beginning of a poem! 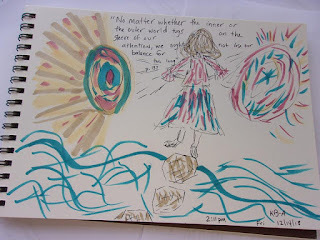 I'm used to going back through blog posts and my offline journals to see what was happening. 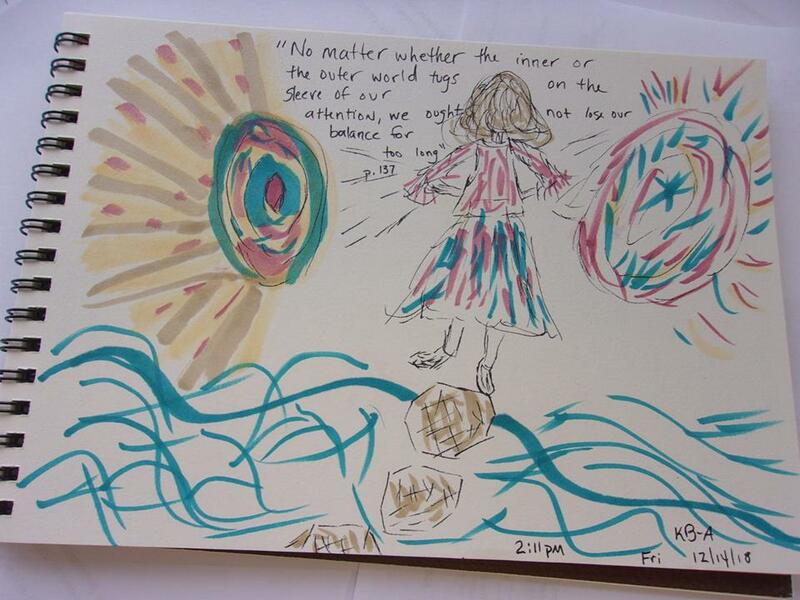 It's only recently that I can do this with visual journaling--how interesting! And now it's off to today's spin class and then to the Visioning session at my church, as we decide where to go as a people of God. Just a regular Saturday! 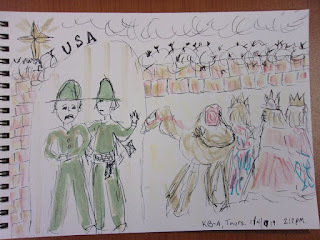 During my 6 week journaling class, I noticed some images recurring in my sketchbook. 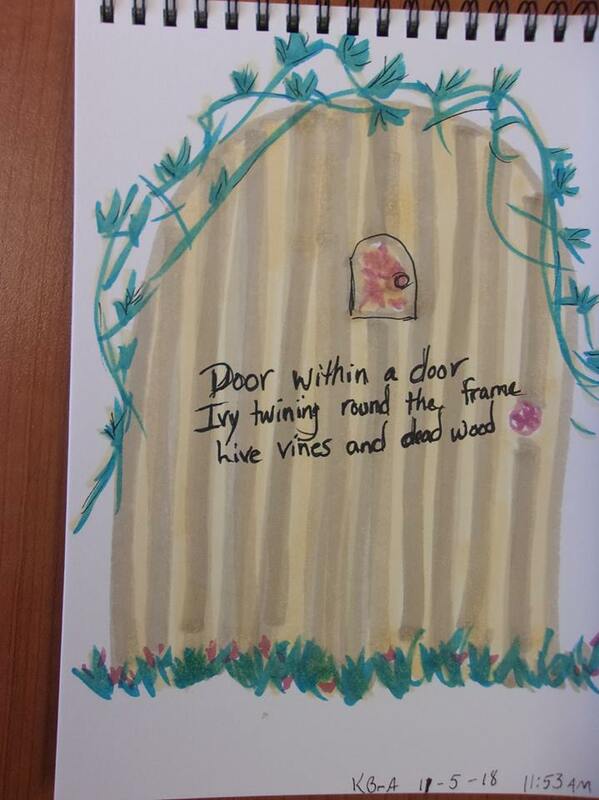 When I look back, I see a lot of doors, but that makes sense: the book we were reading used the door as a metaphor. I see flames and hearts. I see eyes. I also see wings: butterfly wings, wings that aren't attached to anything, wings on regular humans, and angel wings. When we were at the Ringling Museum on Monday, I was intrigued by the variety of angel wings. My friend and I talked about how the angel wings that surrounded us are different from what we think of as angel wings. The wings in the art museum were not light and fluffy. Some of them had intricate feathers. One seemed constructed of peacock plumes. I was surprised by the variety of colors, especially the rust colors and the blues. I wondered if the colors were chosen for their symbolic value or were modeled after actual wings that the artist saw in the natural world. I tried to research this question, but once I typed colors of angel wings into the search engine, I came away with all sorts of new age resources--think angel wings and chakras and channeling--but nothing from the world of art history. As I walked through the museum that was so full of art from time periods that I rarely studied while in school, I reflected on how I would have responded to the art when I was younger. I'd have been frustrated by how few of the artists I'd ever heard of. I'd be annoyed by all the religious imagery, while also hating the portraits. My younger self would have scoffed at all the angels. I am glad to have evolved into my older self, the one who is intrigued by the diversity of angel wings. Now, to remedy my lack of knowledge about art that happened before the 19th century! Last night, I got home, and my mood immediately descended into the basement of grumpiness. My spouse was not as enthusiastic about a fruit and veggie co-op as I thought he would be, and I was not as enthusiastic about the idea of pet bunny as he thought I would be. He thought I had spent too much for the fruits and veggies that we got, but I think he doesn't have the right prices in his head. Frankly, I'm thrilled that someone else did the work of choosing the veggies and fruits for me--that seems worth the $35 cost. My spouse went off to choir, and I sat down to do something at the computer. But then I decided I needed to get some sketching in. I realized that my mood was much improved by the end of the time with my pens, markers, and sketchbook. But I'm not surprised. I'm often happier after I've had a session of creativity. Last night I got back from a whirlwind trip to Tampa to see Carrie Newcomer perform. I'd heard her music and an interview or two, and I really like her. I have a friend at church who likes her too. When I saw that she would be in Naples on Sunday, I let my friend know. She couldn't go on Sunday, but there was a Tampa date on Monday. And thus, a plan was born a few months ago. At first, we thought our spouses might go with us, but that didn't work out. And in a way, that might have been a good thing--two personalities can be easier than four. I've traveled with my church friend before, in a group going to a retreat, so I knew we could travel together. We decided to spend Monday night in a hotel, the Barrymore, right across from the arts center where the concert would be. That was a wise choice. I knew we wouldn't be able to go to the concert and drive home. We didn't find any alternative lodging that was much cheaper. We had a good time exploring the riverwalk area before the concert, and we were in walking distance to great eating spots for dinner and breakfast. The concert was wonderful. She plays with her guitar and a pianist who is quite skilled at jazz improvisation. His accompaniment gave her songs a depth and richness. I love her voice, a much deeper alto than we usually hear in popular culture, with a non-wavering strength that never lurches into full throttled and/or caterwauling. As we came back, we stopped at the Ringling museum. The west part of the Florida southern coast was developed in part by circus money, and the Ringling brothers left a lot of land and money when they died. I had heard about the museum, but I had no idea how extensive it was: an art museum, two circus museums, lots of gardens, and a historic house. We didn't have time to see it all, but we did spend a few hours wandering through the galleries. We both got the Florida educator discount, which meant we got a $10 admission, instead of the $25 regular price. Hurrah! Along the way, we had great conversation. My friend plays bass and ukulele, and she's begun to try her hand at song writing. We're both interested in spiritual development, and we're both the same age, which means we've begun to think about the future in different ways. In short, it was a restorative trip in many ways, and I'm glad we made the effort. I spent the last few weeks returning to reading Jonathan Kauffman's Hippie Food: How Back-to-the-Landers, Longhairs, and Revolutionaries Changed the Way We Eat. It gives interesting background as to how we came to embrace tofu, whole wheat bread, and carob. It's was also an interesting story of how the health food stores that we had in the late 60's and 70's became the Whole Foods chain. It was also an interesting story of healthy restaurants. I was interested in the co-operative nature of the health food stores and restaurants--not just co-operative in how people pulled together, but also co-ops in terms of financial agreements. For example, you could be a member of a health food coop and get cheaper prices on food, or you could walk in and pay extra for the privilege of buying healthier foods. Many of the restaurants began with a group of "owners," all of whom took turns cooking, cleaning up, and buying the food and supplies. I remember a Mennonite co-op (or was it just a restaurant?) in Knoxville, Tennessee, where my mom and I would eat when we were out shopping. It was tucked away in a loading dock kind of area near the big mall near our house. You could get sandwiches on healthier breads that grocery stores had. You could have sprouts on your sandwich, or avocado. We'd been eating sprouts for at least 5 years when we first went to that restaurant, but I'd never had avocado on a sandwich before. I went to school at Newberry College in Newberry, South Carolina, where there were no food co-ops or vegetarian restaurants. The chicken processing plants that had given most residents their livelihood had just shut down, and the economic situation in the town was rather grim. When I moved to Columbia, South Carolina for grad school, I lived in the Rosewood section, which had a health food store and the Basil Pot, a vegetarian restaurant with tables that were made from the big wooden spools that phone companies used to use. That health food store has now become Rosewood Market, in a larger space a few blocks away, and it now includes a cafe. Sadly, the Basil Pot has closed. It moved from the Rosewood location to one closer to the University of South Carolina. It went a bit more upscale, with regular furniture and tablecloths and such. The food was always delicious. I don't know why it closed, but the Rosewood Market has managed to maintain viability. It's hard to think of restaurants that are completely vegetarian in the way that those restaurants of the 70's and 80's were. But we have more options at "regular" restaurants than we did then. And many towns have more ethnic options than they once had. For example, in my old college town of Newberry, there's now a Thai restaurant. Times had to change significantly for that development to happen. I'm thinking of various dietary trajectories that we see today: where will the keto plans take us as a nation? My supermarket already stocks a variety of "milks"--some on the shelf, like the soy milks of my youth, and many more, like a variety of nut milks, in the refrigerator case. And that's the case in smaller towns, like Columbia, SC. I like having the variety, but I do worry about how little knowledge of nutrition so many of us have. We eat the way we eat because a celebrity tells us to, not because we know that by eating these foods we'll get enough vitamin A, while those foods will give us other nutrients. But I'm grateful that it's easier to eat healthy foods now: easier to find them, easier to buy them, easier to prepare them, and easier to find them in restaurants. If you're hoping for an MLK meditation, go to this post on my theology blog. I am now working for a school that has no classes for students on this holiday, but it's still a work day for faculty, administration, and staff. However, I took today and tomorrow off. A church friend and I are headed to Tampa for a Carrie Newcomer concert tonight. Originally, I thought it might be more of a group journey. But it will be fun with just the two of us. My friend is the one who really wants to see Carrie Newcomer. She felt she should make the effort, because she didn't think that Newcomer would ever come to Florida at all. I have been interested in Newcomer's trajectory, particularly the events she has done with Parker Palmer. I rarely go to concerts anymore. Once I went to a concert here and there; I wanted to go more often, but I couldn't afford it. Now I could afford it, but it seems to take so much effort. Take Saturday for example. We had free tickets to see Arlo Guthrie. Once I would have gotten myself to that concert and felt lucky. Saturday, I didn't want to deal with the Ft. Lauderdale traffic, which was already heavy in the morning when I went to spin class. I didn't want to be out late when I had to lead church on Sunday morning. It was partly laziness and partly energy conservation. But I felt a bit of sadness. There aren't many artists that I'm willing to make an effort of money and energy to go see live. I realize that many of these artists won't be with us for too many more years--but it's still a lot of money to see most of them, and a chunk of time. Part of me would rather stay home and make my own art. It turns out that it's fortunate I didn't have my heart set on the Arlo Guthrie concert. My spouse was in such a state of grieving at the news of the death of his favorite Philosophy professor that he'd have been in no state to go to a concert. On some level, it's been strange to see him so wracked by grieving; he's rarely shown that level of emotion over much of anything. On some level, it's good to know that he does still have an emotional life. Yesterday we had a quiet afternoon at home. I finally finished Jonathan Kauffman's Hippie Food. I went to bed thinking about various vegetarian restaurants I have loved--perhaps I'll write a blog post about that tomorrow. I meant to get up to see the eclipse. When I did get outside, it was too cloudy to see much, so I went back to bed, but never really got back to sleep. This would not have been the first eclipse I would have seen with the blood red moon. And hopefully, it won't be my last opportunity to see an eclipse. Yesterday was a tough day in our house. My spouse found out that his favorite undergraduate Philosophy professor, Garth Kemerling, died last year. He was only 69. The obituary didn't say how he died or what he died of. I was sitting in the front bedroom where I write, and I heard strange noises from the back of the house. I found my spouse bent over with his face in his hands. We'd been experimenting with some hair dye, and at first I thought something dreadful had happened to his hair or eyes. But he was sobbing because of the obituary. We spent much of the day crying on and off. Some deaths when they come are expected. I'm thinking of my best friend from high school who had suffered a horrifying esophageal cancer. I still cry a bit here and there, but when the news came, I wasn't surprised. On the contrary, I was surprised she held on as long as she did. Our professor's death came as a shock. Yesterday was one of the days when I realized the value of Facebook. My spouse spent the day corresponding with classmates who were similarly sad. They exchanged memories. They comforted each other. I felt sad not just because of the death of our favorite professor, but because the type of education we all received at our small, Lutheran, liberal arts college doesn't exist much any more. Our education revolved around the questions of our values and how to shape our lives according to what matters. Of course we had important subject matter to learn, but the conversations around that subject matter and before and after class came back to the core values that our institution hoped to instill in us. I am willing to bet that not many people get that kind of education anymore. As I watched the day unfold, I thought of all the times when I wondered if anyone would care if I up and disappeared. Dr. Kemerling probably had no idea that people felt so strongly about his classes and his modeling of young lives. When I feel similar thoughts, let me remember yesterday. My spouse is my favorite Philosophy professor, but Dr. Kemerling was my second favorite. The world needs more Philosophy professors like him, not fewer. Sigh. This week has been one of those weeks where I went to bed embarrassingly early on Friday night: lots of long days at work, spin classes every day as I try to win a bike in the Feb. spinathon, my online classes gearing up, time with friends. In other words, it's been a mix of delightful and drudgery, as most weeks are. --I've been asked to write for Gather magazine again. That makes me happy. --I had a lovely evening where I read Marie Howe's Magdalene straight through. What a wonderful collection of poems, with interesting insights into what it means to be a woman through the centuries. --Although I'm sad about the death of Mary Oliver, I'm delighted to see people posting her poems and talking about how much her work meant to them. It's been a great reminder that a life in poetry can make a powerful difference. --I'm distressed about the state of the U.S. government and this longest government shut down ever. But Nancy Pelosi impresses me beyond measure, even as I wish she'd do something more to break this stalemate. Do I know what that something should be? No. --I wonder at what point air travel will be impacted beyond the longer wait times at the security lines. --I continue to be shocked at the extent to which it appears that the president of the U.S. has been in the service of Russia. I'm the daughter of an Air Force colonel, and I never thought I'd see this day in our country. I am shocked that others, especially those in high office, have not been reacting in a more distressed way. I want to believe that they are quietly, privately distressed, but I no longer have faith in many of these people. --I know that a massive winter storm is barreling through much of the country. While I am glad not to have to deal with snow, I do miss the first bit of a snow, the thrill of the flakes drifting down. I suspect it may be a bit like our rainstorms are here. I used to love a rainy day, but now I worry about flooded streets and the house springing a leak. Snowstorms seem more ferocious these days--welcome to climate change on a wrecked planet. --I've been doing a better job of reading, but aside from volumes of poetry, I haven't actually been finishing books. That will be a goal for next week, to actually finish one of the many books I've started. --It's interesting to reflect on this time period as one of shut downs: the government shut down, the LA teacher's strike, weather that cripples us. The shut downs that leave us limping seems like an overarching metaphor. I confess that I am late to loving the poet Mary Oliver. It was not until this past year, to be specific, that I really read much beyond "The Summer Day" poem--and to be truthful, I hadn't read the whole poem, just those 2 final lines: "Tell me, what is it you plan to do / with your one wild and precious life?" During the season of Lent, a group of us at my church did a 6 week series of journaling exercises that came from the intriguing company SALT; it's still available here. 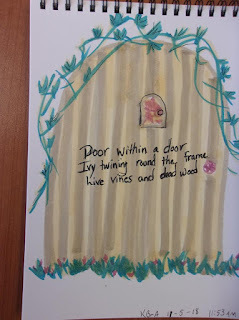 Each week gave us a Mary Oliver poem, a passage from the Bible, and writing prompts. It was during this journey that I realized the scope of Oliver's talent. I had made the mistake of many critics: I saw her poems as short and fairly simple. If I thought about her at all, I probably had vague thoughts of a nature poet. While she's certainly working in that tradition, she's doing so much more. I don't think I had ever read this poem before 2018; those first three lines made me woozy with a variety of emotions. And yet it's not a poem that encourages us to hedonism--no, it calls us to be more attentive, to be present. Before our Lenten journaling group, I hadn't realized the spiritual nature of so many of her poems. During Lent, we read "The Poet Thinks about the Donkey," a poem that considers the donkey that carried Jesus into Jerusalem, an event Christians celebrate on Palm Sunday. As with many of her poems, I thought I understood it on the first read, and then it stuck with me much longer than other poems that are more complex. During one of our sessions at church, my parents were with me, and later my Dad called to get the name of the poet we'd been reading. One of the things I admire about Oliver's work is its wide appeal to so many people. The poems are profoundly moving--and yet so quiet, so easy to grasp. I love that the poems are short--easy to read in a single sitting. I love that the natural elements draw us in to hear the central message. I love the theology of these poems. It's a theology of love and respect. It's a theology that tells us that we are worthy. It's a theology that tells us we don't have forever, so quit wasting our precious days. It's a theology rooted in nature, but in the every day kind of nature, not the travelling to a distant mountain slope with sherpas to assist us kind of nature. It's a theology so understated that many readers likely don't even recognize it as a theology. I want to write these kinds of poems, poems that point towards the Divine, rather than shoving readers in that direction. I've been typing poems into the computer, which means I've been reading through some poetry notebooks. I've also been sending poetry packets out to journals, which means I've been reading old work. I've been thinking about my apocalyptic poems and how they've changed since the election of Donald Trump. I'm wondering about those changes. Clearly they were prompted by Trump, which means those types of apocalypses envisioned by Atwood could be possible--a hostile government comes into power and things go downhill quickly. I had always seen the history of the west as a progress in a fairly linear direction towards greater freedoms. At least that's how I viewed post WWII history once the Soviet Union crumbled. My pre-Trump apocalypse poems often revolved around natural disasters, not political disasters. My post-Trump poems are different, in a way I can't quite articulate yet. The disaster is more shadowy, but it's clear that people must get moving. I've also been wondering if my poems are different now because I've been reading different apocalypse poetry since the election. For example, in the waning months of 2016, this poem by Adrienne Rich kept appearing in a variety of places. I wrote several poems inspired by the imagery in this poem: abandoned meeting houses, revolutionary roads, people disappeared. like the world has never seen. which struggle in this heat. and how to read a Geiger counter. and set it on a warm windowsill. I think of the geography of the Pacific. globe that names countries that no longer exist. I wait for news updates. I am reading a wonderful book, Jonathan Kauffman's Hippie Food: How Back-to-the-Landers, Longhairs, and Revolutionaries Changed the Way We Eat. It gives interesting background as to how we came to embrace tofu, whole wheat bread, and carob. Well, some of us did. Much of it I already knew--but he connects the various people, food, and movements in interesting ways. In some ways, my life has been a microcosm that reflects some of these changes. I remember my mom's tuna noodle casseroles and pot roasts. I remember when beef was very expensive during the 1970's--now there are weeks when veggies cost more than beef or chicken. As my dad got into running, and as we met interesting people at church, our family experimented with unfamiliar foods. I remember a young intern who served a church we attended--she was a vegetarian and baked her own bread. She wasn't the first vegetarian we knew--that would be one of my mom's cousins. One summer, my mom had me help her with a bread baking experiment--I was hooked. As I've been reading Kauffman's book, I'm remembering my stricter vegetarian days when I experimented with a variety of ways to get more protein into the breads I baked: soy flour, dry milk powder, nuts and seeds. These days, my protein intake is fine, but I worry about needing more fruits and veggies. In terms of the other foods Kauffman covers, especially the chapter on soy, I'm not as much of a fan. I've done lots of experimenting with tofu and never found a healthy way of cooking it that resulted in something delicious. My experiments with tempeh have been disastrously inedible. Yesterday, I thought of all my cookbooks, when our library assistant told me how much the librarian loved the Moosewood cookbook that I had used in a library display. The librarian planned to buy her own copy. I wrote to the librarian to tell her that she could take that book--it was on my donate pile because I have too many cookbooks. She wrote me a rapturous thank you note. My reading has made me think about the communities that produced these cookbooks, the Moosewood restaurant that made those cookbooks possible, along with the more loved (by me) books by Mollie Katzen. Kauffman explores the Tassajara bread book and the other whole food cookbook, which I owned for awhile. By the time I got the Tassajara books, I already had enough bread baking experience that I didn't really need them. Now I don't need many cookbooks at all. I know what I want to eat and how to make it. I'm fascinated by the communal aspects of this food, by the communal care that was so much more prevalent in the 60's and 70's. Lots of unwashed, hungry students descend on San Francisco? Let's feed them! Last night, I had a lovely night of reading, writing, and sketching, as I waited for my spouse to come home from chorale rehearsal. I read a few posts by a blogger who is baking in retirement and thinking about the theology of baking bread (go here and here). Maybe it's something about winter; rabbi Rachel Barenblat is also returning to bread baking, as she writes in this post. Last night, I wrote this Facebook post: "It's 8:25 at night--much too late to start baking bread, and yet I have this yearning to knead dough. I have no countertop, and an inadequate work space on a wobbly table. I would likely fall asleep before the yeast was done rising. I will not stay awake until the wee small hours of the morning baking bread and writing poems." If I didn't have such a full day at work today, I might be tempted to take a mental health day: I'd stay home, bake, and then this evening head down to Miami for a poetry reading. But because it's a full day at work, that will not be the day that I have. Today is Dr. Martin Luther King's true birthday; Monday is the day when many of us get a holiday. We will likely hear many people declare that this week-end should be one of service. As a Lutheran and a social justice person, these declarations make me grumpy. Every week should be devoted to social justice, and that's one of my spiritual goals, to make sure I do some work of social justice and/or charity each week. Of course, I realize that the rest of the nation could stand to be reminded periodically of the necessity of service and social justice work. It's a dark time, in many ways, and I find the words of King still inspiring, still consoling, still hopeful: "Here and there an individual or group dares to love, and rises to the majestic heights of moral maturity. So in a real sense this is a great time to be alive. Therefore, I am not yet discouraged about the future. Granted that the easygoing optimism of yesterday is impossible. Granted that those who pioneer in the struggle for peace and freedom will still face uncomfortable jail terms, painful threats of death; they will still be battered by the storms of persecution, leading them to the nagging feeling that they can no longer bear such a heavy burden, and the temptation of wanting to retreat to a more quiet and serene life. Granted that we face a world crisis which leaves us standing so often amid the surging murmur of life's restless sea. But every crisis has both its dangers and its opportunities. It can spell either salvation or doom. In a dark confused world the kingdom of God may yet reign in the hearts of men." Those words are from King's address when he won the Nobel Peace Prize in 1964; it holds up remarkably well, as do so many of King's writings. Years ago on the NPR program Talk of the Nation, Tavis Smiley and Cornell West discussed King's legacy. They talked about the fact that when King died, he was not the beloved person he is today. Smiley said, "King's life was really about three things: justice for all, service to others and a love that liberates people. Justice for all, service to others and a love that liberates. Sometimes, when you have that as your agenda, you're not popular. You're not understood." The whole interview is well worth a listen or a read (go here). Just think how profoundly our society would change if more of us devoted our lives to these three things: justice for everybody, service to others and love that liberates. There's a worthy goal to keep in mind, not just this week-end, but every week-end. Yesterday I went to the celebration for a colleague who will soon fly to South Korea to adopt a daughter. The girl is 18 months old, so it wasn't exactly a baby shower. It was held at a picnic shelter at a huge community park. I thought that choice was brilliant. Many people brought their children and their dogs, and there was plenty of space. We had delicious food with Korean condiments, along with the traditional choices. We were asked to bring a favorite child's book. I chose Amelia Bedelia, which may be responsible for the beginning of my love of language. Amelia Bedelia is the maid who takes directions literally: when asked to draw the drapes, she whips out her sketch pad and gets to work. The weather was perfect, and I enjoyed spending time with my colleagues. I've said it many times before, but it bears repeating: I've been very lucky in every school where I've worked to have great colleagues. In a way, being there made me feel very old: my childbearing years have come and gone. And I can scarcely imagine navigating what it would take to simply travel to South Korea, much less navigating an international adoption. But it was also affirming in a variety of ways. In these days when the news is so often full of the bleak and the glum, here's a couple making a much better life for a little girl half a planet away. I wish them all the best, and I know they'll have plenty of support in this effort. When I got home, I checked in on my online classes and heard the end of the local public radio show devoted to folk and acoustic music. The broadcaster said he had a tickets to see Arlo Guthrie, and if anyone was interested, to give him a call. I didn't copy down the phone number fast enough, and when I called the number on the website, I got the front desk, which told me I was calling when the office was closed. So I wrote to the e-mail address I had for the broadcaster. In half an hour, as we were carrying the trash and recycling to the bins, the broadcaster called back--he's putting the tickets in the mail. Hurrah! It made me remember my childhood, when my mom was always calling the radio station to win tickets or albums or t-shirts. The best thing she won was tickets to King's Dominion, a huge amusement park (like Carowinds or 6 Flags, but a bit short of Disney). We all went for free, and because it was the week-end before the last week-end, the place was deserted: no lines for rides! It was a perfect day. I felt a bit like I was channeling my mom as I procured those tickets. Happily, she's still alive--I'll have to call and tell her. I thought about my parents yesterday too, as I read the soon-to-be-gifted copy of Amelia Bedelia, in its anniversary edition. It came with a section that told how the story came to be. What a treat to revisit a childhood classic! And now it's time to get ready for the week: there's day old bread and pastry to pick up from Publix, and last minute stuff to get ready for the site visit. There's an ancient Spanish monastery in Miami, and the story of how it came to be here is amazing--for more, see their website. I've been wanting to go see it for years, but the days when I could go, they have been closed. I loved this juxtaposition of a bride and suit of armor. I'm astonished at how we're allowed to touch just about everything. Perhaps they figure that the subtropical climate is much more of a threat to the centuries old structures than the oil of our fingers. There were "crystal" chandeliers hanging in the trees; are they there all the time or just for the wedding that would take place? The tour was worth it--just the right amount of time and information. This nativity scene is apparently popular: #4 on some worldwide list. This room, the chapter room, has the best acoustics--in the original monastery, monks would gather to hear the abbot read to them. My spouse went back after the tour and sang Dona Nobis Pacem, and it was the high point of our time there. This labyrinth is one of the smaller ones I've seen. Could we create something like it in our back yard? It was the perfect kind of outing, something outside of what we usually experience, much more interactive than a movie, with physical activity and mental stimulation. What a great way to spend part of our Saturday! I so enjoyed our time on the porch on Thursday night that we had dinner on the porch again last night. I wanted to capture the monastic chapel kind of vibe we've created. Yes, I am aware of the irony of trying to capture a monastic vibe as we ate hamburgers. I had the kind of administrator day that exhausts me: doing the last prep work of getting ready for a site visit by accreditors. It's not the big visit; it's scheduled for 2 hours on Monday, and then the same person will be doing a site visit for the Ft. Lauderdale campus (there's an advantage to having the same executive director for each). Still, a site visit requires assembling many files and moving them to the conference room. But we are ready! I emerged blinking into the late afternoon sunset after a day of squinting at folders and getting small cuts from file tabs. My back ached in a strange way; after all, I hadn't spent the day slumping in my desk chair, but had been going back and forth from office to copy machine. It was a relief to sit on the porch and watch the light change. The family across the street was having a birthday party for the toddler, and guests arrived. It felt strange to feel excluded from a party I didn't want to attend. Eventually, we moved inside. We were oddly chilly, so we decided to have a fire in the fireplace that we only use once or twice a year. That cheered me up. When I drove home, I expected to crash into sleep before 7, but I'm happy to report that I stayed awake until 9. I explored the camera to try to get it back to a setting that allows me to take pictures more quickly. I succeeded! Before I took a picture and the picture froze on the picture for what felt like 10 minutes. Now I can click, click, click. Today we may go to a real monastery. I've been wanting to go to the Ancient Spanish Monastery in North Miami Beach, and they seem to be open; in the past, when we've thought of going, they were closed for a special event. I woke up before I meant to--I had a coughing fit and found myself fully awake. I got up thinking I might go back to sleep, but as is often the case, I didn't. I spent some time looking through my poetry notebooks from October 2017 to now; one of my goals for this year is to type more of my finished drafts into the computer. I am struck by all the hurricane imagery in these poems, which is no real surprise--Hurricane Irma came through in September of 2017. I'm still seeing hurricane damage mainly in terms of trees that are permanently bent and roof repairs in various states of progress. Of course, I also see the trees that aren't there, like the beautiful frangipani tree that I saw on my way driving to and from work. I had looked forward to growing old with some of those trees, but now, they're gone. And of course, because of the hurricane, along with reports of faster sea level rise than expected, we're rethinking those retirement plans too. It's been a delightful morning. I often wonder if I wake up early because I so treasure these early mornings of creativity. I suspect that's true. Of course, our evenings are lovely too. Last night we ate supper on the porch--it's dark now when we do that. But I don't mind. We have a variety of lights on a hurricane wrecked table that we moved to a corner of the front porch: fairy lights in wine bottles and candles lit by batteries. Our Advent wreath has stayed on the porch too, and last night, my spouse lit those candles. As the arches of our front porch were lit by various flickers, it felt very much like we were camping in an abandoned chapel. Now it's off to spin class and a full day preparing for a routine visit by state auditors on Monday. What Should We Do with Our Gifts? This morning, I went to an extra early spin class--5:30-6:00 a.m. We did an 80's video ride. How strange to see the Beastie Boys yelling at us to fight for our right to party. How strange to reflect on their later fight to free Tibet. I would give them credit for raising the consciousness of a generation of listeners on that issue. Is Tibet free? No, but more of us are paying attention. I'd call that a success. I had already been thinking these thoughts, after a Facebook friend talked about Jeff Bezos and which multimillionaires do the most for their communities. She talked about watching the movie Paris Was a Woman and realizing how much change a woman with some money in the arts world could make happen. 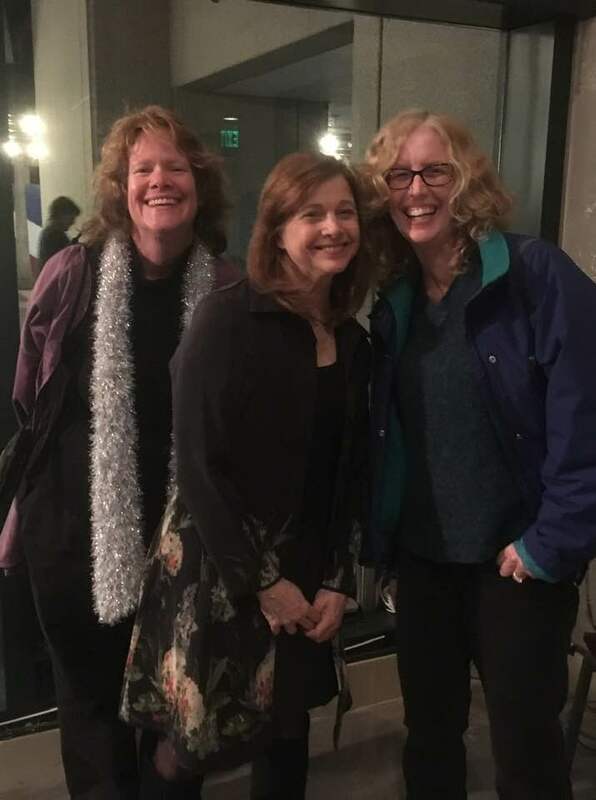 I wrote, "I have often said that if I won the lottery or came into a sum of money, I'd have a great time funding various presses and groups that supported the work of women and others who haven't yet seen full representation. I don't daydream so much of having a press of my own, but of being a benefactor." When I was much younger, I could have given you a specific list of those groups. As the years went on, and it's become clearer that I'm not becoming rich in an overnight way, I've let the list lapse in my mind. I'm also thinking of the newly sworn in Congress folks, some of whom must still be surprised to be there. Do they have plans? I assume so. Here, too, once when I was young, I could have told you exactly what those new legislators should address, and in what order. I might have been thinking about how to write the legislation. Now my imagination feels as gridlocked as the current Congress. It's time to shutter our imaginations. I've been sending out my book length manuscripts, which has made me feel surprisingly hopeful--and that hope spreads to a variety of other arenas, not just my writing life. In this season of self-improvement (or at least the season that is these first few weeks of January), let me also remember this nugget of wisdom in a Richard Rohr quote--I found it in Joyce Rupp's Open the Door: "The goal isn't to get somewhere. The goal isn't about forcing something to happen. The goal is to be in harmony with the gifts that are already given." If only it could be that easy--but that would mean we've discerned what gifts we have. And of course, that we know how to be in harmony with them. Still, in times like these first few weeks of January, when people's thoughts turn to self-improvement, it's interesting to think in terms of already having what we need. How would our lives changed if, instead of wishing we had different gifts, we learned how to best utilize the gifts that we have. Notice that I'm still using self-improvement language: "learn how to utilize." The phrase "being in harmony" suggests something different to me, a gentler, wiser approach. That language of being in harmony brings to mind sitting with a friend, a pot of tea, and some delicious scones. I have been awake since the wee small hours of the morning, earlier than usual even for me. I woke up about 1 a.m. hearing noises. I came to think it was just the fridge, but by then I was awake. I even tried going back to bed—no luck. When I came home on Friday, my spouse was in the process of killing a rat that he had trapped in the bathroom. Surprisingly, I was able to sleep through the night Friday night and the nights since. So when I heard odd noises a few hours ago, my first thought was that another rodent had gotten in. Since I was up, I did some journaling, which was very satisfying. It was the old-fashioned, writing offline type. 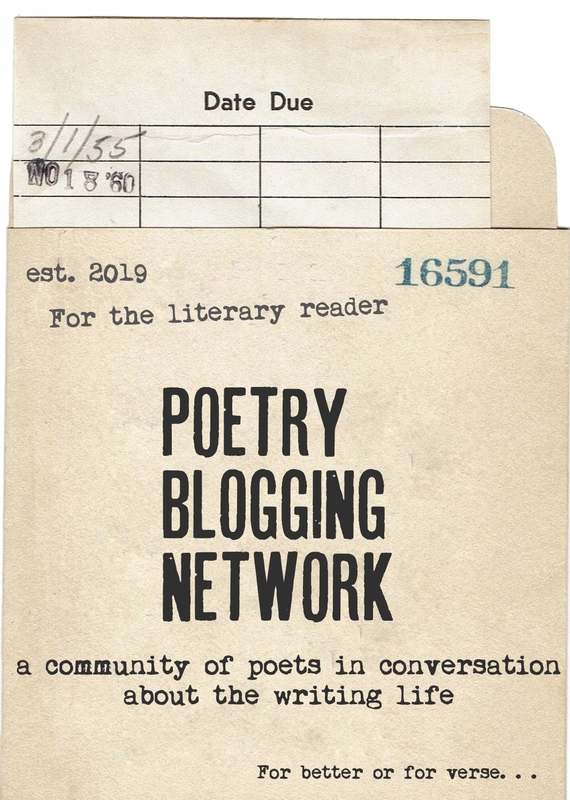 I'm going to be intrigued, as the months go on, by how my sketch journaling dovetails with my blogging and all of that with the offline writing I do--and of course, with my fiction and poetry writing too. I am also intrigued by the much shorter writing that many of us are doing--some of us write fabulous nuggets in our Facebook/Twitter/etc. posts. Has any graduate student studied those yet? "If I'm ever president, and I have a speech that I want people to hear, I won't disrupt their evening TV viewing in prime time. I'd give the nation a day off, and then people would be more receptive to my message. And I'd deliver the speech not in my office, but in a kitchen, at a table, set with a tea pot and some mismatched mugs and cups. Scones would come out of the oven. Oh, wait, maybe that's a different daydream, one where I'm a spiritual director waiting on the next group of pilgrims . . ."
in folders across multiple cabinets. the feeders and listens to each chirp. but she writes nothing down. each creature and every preference. that will attract the birds and the butterflies. year can take care of itself. Many of us have just come through a liturgical season full of stories of angel visitations. We may have heard of the angel Gabriel coming to Mary. We likely heard about choirs of angels appearing to shepherds. Maybe we also heard about the angel visiting Joseph or Zechariah. Even the Epiphany story is full of angels. In so many ways, our modern times have changed our view of angels. Most of us probably don't believe that angels exist. If we believe in angels, we certainly don't expect to see them or get a message from God through them. I've been intrigued through the years by talking to people about their belief in guardian angels. For some of them, it's a friendly relative watching out for them from a heavenly perch. For others, they're not sure of how angels are assigned, but they're certain that they have one. Would angels have made the kind of appearances that they do if we had done the online journaling class in the summer? Much of the class took place over the season of Advent, so I had angels on the brain. I was also covering Gabriel Garcia Marquez's "A Very Old Man with Enormous Wings" in the literature class that I taught, so I had a different sort of angel on the brain. 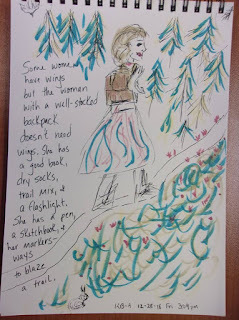 I had planned to draw a backpack spilling open to reveal wings inside, along with a pen and a book and a dry pair of socks. But then I couldn't figure out how to draw an open backpack. 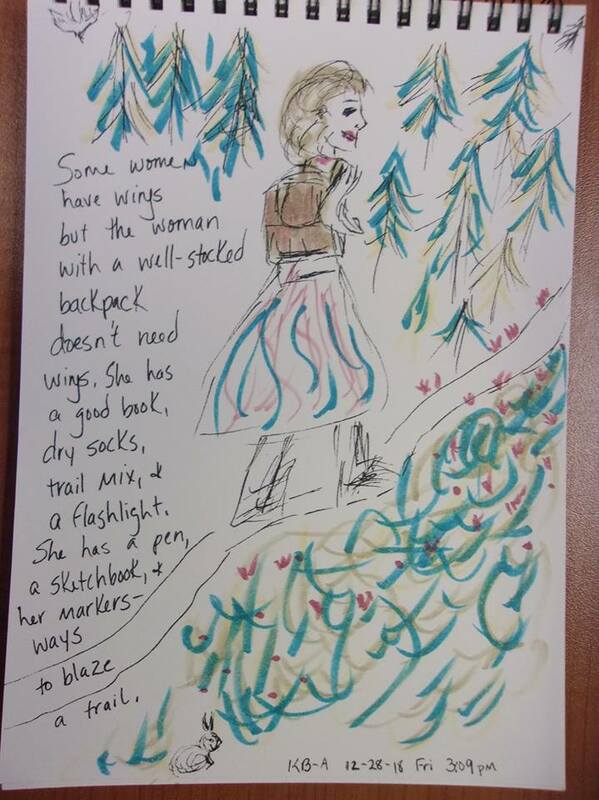 And then I thought, a woman with a well-stocked backpack doesn't need a pair of wings: and voila, a sketch and a poem-like thing! It made me think about angels again--about how my human who probably represents me has progressed from having wings to not needing them. Would I also say the same thing about angels? I have always worried about the human propensity for needing an outside force, whether it be to save us or give us a vital message or fix things. Angels tend to fit into this category. We may joke about how much easier it would be to believe if we had a sign like angel choirs singing in the skies--but we often neglect the much more regular miracles that might point us to the Divine. We may wait for our guardian angels to step in while never making the small steps to improve our lives. Do I really not believe in angels? I have no idea if they exist in literal life or not. I do believe in them as very potent symbols. Then we headed off to church. I wasn't planning to write a poem, but one came--and then this morning, I shaped that poem beginning into something more finished. Then yesterday, I made a sketch, inspired by the poem; I was especially taken by these lines: "Avoid the houses made of gingerbread / and all the traps the world will set." When I got home, my star word was waiting from a member of a Facebook group. I decided to make it into a card, so that I'd remember as the year went on. My star word is journey--it's one that was chosen blindly for me. It's been interesting to see the words that others have gotten and to compare them to mine: care, anoint, steadfast, care, future, prepare, spirit, inheritance. The rest of the day was not as creative, as I had lots of work to do to get my online classes ready. But that's O.K. With a creative morning to undergird the day, I'm happier regardless. Today is the feast day of the Epiphany, the day the celebrates the wise men (or magi or kings or astrologers), the skies they studied, and the star they followed. There's a shadow story, of King Herod who felt so threatened by the birth of a new king that he killed every male child under the age of 2 in Bethlehem. For some of us it is the last day of the Christmas season; you could celebrate until Feb. 2, the feast of Candlemas, the 40th day after Christmas where Jesus would have been taken to the temple. I checked off the goals that I accomplished. I also baked the communion bread for church this morning. We're experimenting with gluten free recipes. Even a gluten free bread makes the house smell wonderful. It's been a lovely morning. Later I will think about getting my online classes ready; they open at midnight, but I still have plenty of time. It was important to me to have creative time this morning. Few things make me happier. This week has been up and down for me, as the first week of January often is. I feel the sadness of the holidays leaving us, along with the sadness of the zooming of the years. It's an Ash Wednesday kind of mood: we are dust and to dust we shall return, and faster than many of us are aware. I no longer castigate myself for all I have not accomplished. Making it through the day to day grinding aspects of the past 2 years has seemed accomplishment enough: the larger perilous times we seem to have tumbled into, coupled with hurricane repairs, and some family health issues. --Last night I went out to socialize with a group from work. I think it's the first time that I've done that in this new job, which is no longer a new job, since I've had it for 2 years. We went out to celebrate one of our colleagues who is moving to the Ft. Lauderdale campus. It was very pleasant, which doesn't surprise me. My campus colleagues are very pleasant, which is a good thing, since we spend so much time together. --I got home to find my spouse in the process of killing a roof rat that had gotten in the house. Yes, we have a house that is more sealed up than it ever has been, and this is the time we get a rat in the house? Insert a heavy sigh here. --I think of all those pop songs where a lover declares something along the lines of "I would catch a grenade for you"--that's all well and good, but would you do the dishes for me? Would you vacuum so that I didn't have to do it? Last night--would you kill a rat in the house for me? My spouse did. And he cleaned up the mess from having to do it. --I have a variety of ways that I evaluate humanity. Last night was a shining moment for my spouse. I have no idea what I'd have done if he hadn't been here to take care of it--leave the house and spend the night with a friend? He showed me how to work the pellet gun, but I'm pretty sure I'm not a good enough shot to hit a small critter. --It's been a week where I've seen more friends than usual. That's both a plus and a minus. It's great to catch up, of course. It makes me sad to see/feel how far flung we all are, even though we still live in the same county. It was much easier to maintain that closeness when we all worked at the same school, where we could eat our lunches together or take time for a cup of tea or coffee. --My new approach to weekly goals (see this blog post for details) is working well. Hurrah! I have written 2 new poems and sent out two packets--that might not seem significant, but those weekly goals were on my list, and I did them. Having the log/list above my writing desk helps me stay focused each day. --I am participating in this month's spin class challenge--the one who attends the most classes gets a free spot in the Feb. spinathon. I have a real shot at winning, so I'm going to press that advantage now, before the traveling that comes later in the month takes over. After the eating galas of December, I can use the opportunity to burn some extra calories. I've only gained a pound or 2, but I need to reverse that trend. --I've been exhilarated by all of the pictures of the women House members arriving and taking oaths and holding children and comforting each other. We've got considerably more women now than when Nancy Pelosi was last Speaker of the House (same number of women in the Senate, however). We still don't have parity. But we have a transgender member now, and a bisexual member. Those firsts feel VERY important to me. I know that previously marginalized populations bring a very important perspective when they gain some power--it doesn't always work out perfectly, but it helps society lurch towards the arcing of history towards justice that MLK talked about. Yesterday, as I drove to a very early morning spin class, I had a vision of a poem. 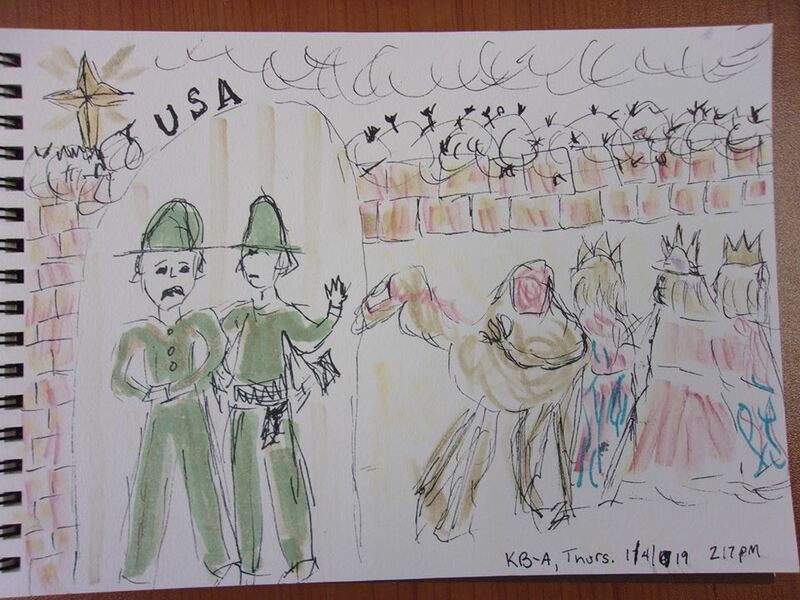 What would happen if the 3 wise men had come to a border situation like the ones we have in the southern parts of the U.S. 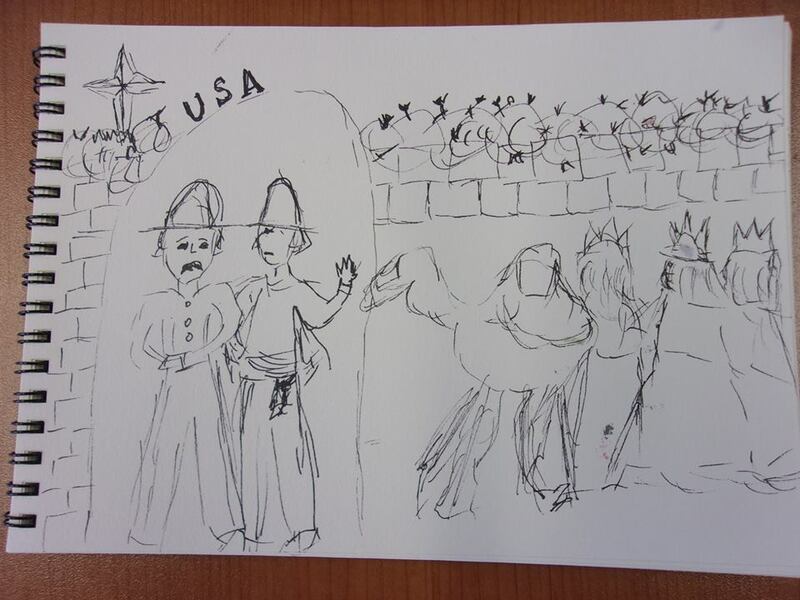 I had planned to write a poem, but I also had a vision of a wall and border guards and wise men. 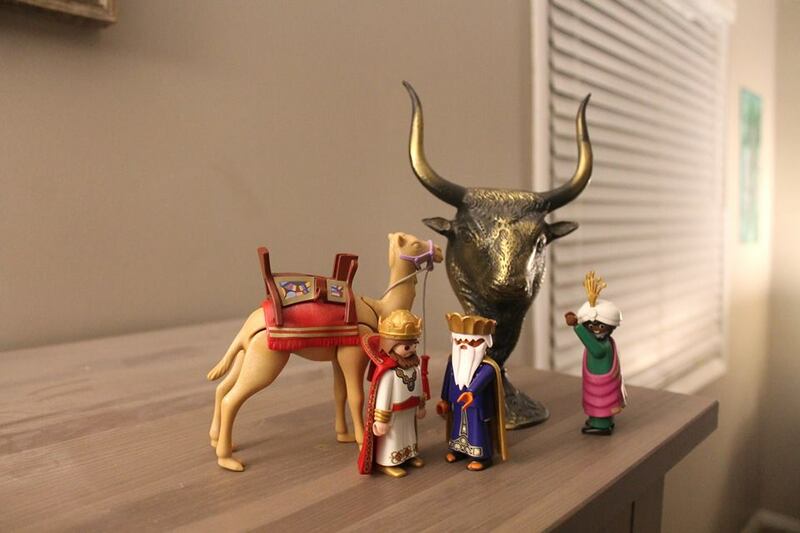 Perhaps it shouldn't surprise me that I combined the idea of the 3 wise men and the modern news cycle. 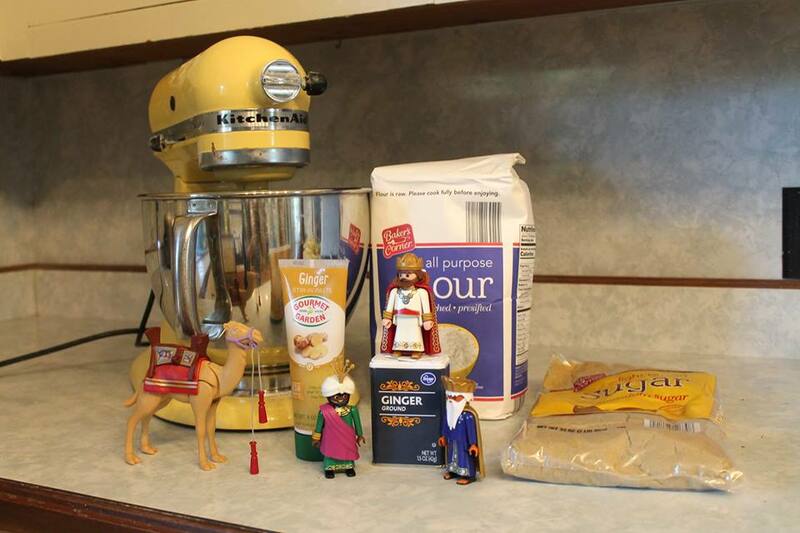 I have been greatly intrigued, and at times highly amused, by the Internet meme of the 3 plastic wise men and a camel who make their way across modern landscapes. The wise men look like children's toys, and upon doing some "research," I've found that they're made by Playmobil or Fisher Price. I have no idea how many people are doing this. I haven't participated this year, but perhaps in later years. Each post has a written tag too. 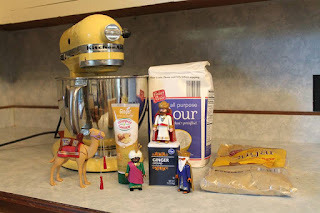 Here's the one for this picture: "Day 21: Hezekiah’s desire to bring baked goods to the infant king was met with enthusiastic support from his companions." Until this morning, I didn't realize how many people were doing this project as a reaction to the Elf on a Shelf--a way to have a daily practice that's whimsical but doesn't involve Santa. This morning I attempted the poem that started to glimmer at me yesterday. It did not turn out to be the poem I first thought about. 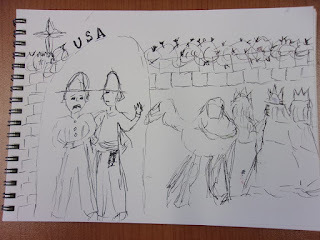 This morning's poem begins, "I am the border agent who looks / the other way. . . . " The poem goes on to reference the East German soldiers who didn't shoot as people assembled at the Berlin Wall in 1989, but the wise men do make an appearance later in the poem. The post reads: "Gaspar and Melchior were firmly opposed to any involvement with golden cows, citing disastrous outcomes for Old Testament travelers." I wonder what could be done with other parts of the year? Hmmm. Something to ponder. I've been writing about returning to regular life, as if any part of life stays regular for very long. I'm thinking of all the federal workers who remain without money because of the partial shut down. Let us now offer up a quick prayer for all the governments that re-open today--and the federal agencies that remain closed because of the shutdown. I cannot imagine being a brand new U.S. senator or representative arriving to Congress today--so much that needs to be done and so little will to do it. I want to believe that people run for office because they have a vision of improving the world, not because they want to stonewall any movement at all. I am about to head to a spin class that is a special option for January. My wellness center is having a contest; the person who attends the most spin classes in January gets a spot at the spinathon in February, which is at least a $25 value. I'll play along, even if it means going to a 5:30 a.m. spin class. My friend posted on my Facebook timeline: "It's 4:22 and I've made it to the last episode of Wolf Hall. You up? I'm guessing you're either baking or writing!" I wrote back: "I have been writing! Baking is much harder--I have a stove, but not much work space. Some day, it would be lovely to have small cottages/dwelling spaces near each other. We could devise a system of lights in the window. Twinkly lights would mean we're working/watching/not wanting to be disturbed. A solid shining light would mean the kettle is on and the scones are baking. Ahhhh, dreams of the future!" I love that vision of a community close by, but not living under the same roof. I still have this vision of a plot of land with little cottages and several communal spaces. But as I've been writing and Internet zipping, I've been thinking about how Facebook/online life gives me a foretaste of the feast that may or may not come. I love that my friends can reach out if we're both awake/free to communicate at the same time. If I'm immersed in something else, I can wait before I answer. Or we can have a discussion. It's not as good as a pot of tea and fresh baked scones, but it's better than the more solitary life I once had as an artist back in the 90's.